England 4-190 (Alex Hales 116*, Eoin Morgan 57, Nuwan Kulasekara 4-32) beat Sri Lanka 4-189 (Mahela Jayawardene 89, Tillakaratne Dilshan 55, Chris Jordan 2-28, Jade Dernbach 2-42) by six wickets. A sizzling unbeaten ton from the English batsman, Alex Hales converted an impossible task into a great success while chasing a huge target set by Sri Lanka. The Lankan Lions managed 189 runs for the loss of four wickets in 20 overs and England hammered 190 with six wickets in hand and four balls available. 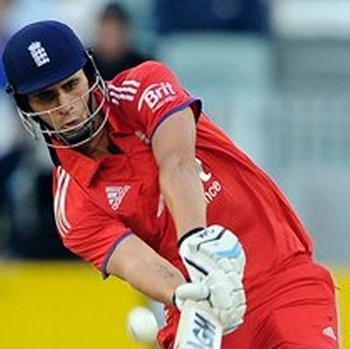 Alex Hales (England) was declared ‘Player of the match’ for his blistering unbeaten knock of 116 from 64 mere balls. The ICC World T20 – 22nd match, Group 1, was held on Thursday, March 27, 2014, at Zahur Ahmed Chowdhury Stadium, Chittagong. Earlier, Stuart Broad, the skipper of England, won the toss and went for bowling. The Islanders lost their first wicket at four as Mahela Jayawardene and Tillakaratne Dilshan took the score to 48 in seven overs. The first was dropped at 22 in the next one while the latter attained his 8th T20 fifty and was let down at 80 by Tim Bresnan. Dilshan reached his 9th T20 half century in the process and the 145 runs partnership was dislodged in the 17th over. Mahela Jayawardene was gone for 89 off 51 with 3 lofty sixes and 11 fours and his partner departed seven runs later for 55 as their team scored 4-189 after 20 overs. Jade Dernbach and Chris Jordan were the wicket taking bowlers with two each. England was in hot soup from the first over when Nuwan Kulasekara got two wickets. Eoin Morgan joined in next with Alex Hales and they started mending the early loss in a brave style. The duo opted to attack and enhanced the score to 72 in 10 overs. The latter was the most aggressive of the two and rushed to his fifty in the 13th one with 3 boundaries while Morgan got his half century with a four. Alex Hales accumulated 24 runs in the 15th over off Ajantha Mendis with 3 huge sixes and 1 four. The third wicket association was dismantled at 152 when Eoin Morgan departed for 57. Hales continued with his blast, he thrashed his maiden T20 hundred with a big six and dispatched the winning six on the second delivery of the last over. He secured his end with 116 off just 64 comprising 6 powerful sixes and 11 fours. Ravi Bopara was at the other side at 15 as the Englishmen hammered 4-190 in 19.2 overs. Nuwan Kulasekara was the only successful bowler with four wickets whereas none other left any impression. England clinched their important encounter with a margin of six wickets and opened their account with two points.